If the world used just geothermal, global electricity generation emissions of CO2e would be 1/10 of Natural Gas, 1/18 of Oil, and 1/21 of Coal emissions. Low carbon electricity is a wonderful thing, and will be a central part of tackling climate change. In 2010 electricity generation was responsible for about 13 Gt of greenhouse gas emissions, or a little bit more than a quarter of all emissions. The rest came from industry, transport, buildings, agriculture, forestry and waste. The thing that is exciting about electricity from a climate standpoint is that we actually have technology which can slash its emissions. To help provide some clarity and context as to the relative importance of low carbon electricity this post tests a simple idea. What would global electricity generation emissions look like if the world used just one generation technology? In 2010 the world generated 21,400 TWh of electricity which resulted in emissions of 13 Gt CO2e (the beige balloon) given the current fuel mix. Using the central estimates from the Intergovernmental Panel on Climate Change (IPCC)’s excellent meta-study of electricity generation lifecyle assessments we can estimate what these emissions would look like using just one technology. The results are stark. Using Coal 21,400 TWh would result in 21 Gt CO2e, for Oil it is 18 Gt and for Natural Gas it is 10 Gt. In contrast Geothermal and Solar PV are 1Gt, Solar CSP is 0.5, Biopower and Nuclear 0.4, Wind 0.3, Ocean 0.2 and Hydro 0.1 Gt. The gap between fossil fuels and the rest is a chasm. There has been much made of the idea of African ‘lion’ countries, mimicking Asia’s famous ‘tigers’. An aptly impressive piece of imagery for the economical roaring into life Africa has been long overdue. If you ask me, there is no reason Africa shouldn't start behaving like Asia, and why hordes of international businessmen shouldn't be getting on planes to go to air-conditioned offices and lavishly appointed bars in cities like Nairobi and Dar Es Salaam well within my lifetime. The thorns that need to be removed from the paws of these lions are several, however, and too intricate an issue to squeeze into my introductory paragraph. But I do propose that renewable energy, in particular geothermal energy with its formidable baseload potential, can help provide the electrification (two meanings intended) that sub-Saharan Africa needs, bringing international partnerships and healthy and competitive economies with it; and that there is both the potential and the market for it. Geothermal energy is derived from heat produced by the decay of radioactive elements within the Earth’s molten core, where temperatures reach 6000°C around 6000 km below the ground. This heat naturally dissipates upwards towards the earth’s surface. Geothermal energy is usually associated with countries that have active volcanoes, for example Iceland, where, geothermal energy provides two thirds of the country’s primary energy, mainly used for heating homes, and 25% of its electricity generation. While the UK does not possess any active volcanoes it does have several geological features at depths of between 2-4 km that are potential geothermal targets, albeit with lower temperatures of around 60-80°C. Power Sector Assets and Liabilities Management Corp. (PSALM) said Wednesday it will hold the bidding for the contract to manage the 440 MWe capacity of the Unified Leyte geothermal power complex in October. PSALM’s privatization bids and awards committee issued the invitation to interested companies, electric cooperatives, distribution utilities and directly connected power consumers to bid for the selection and appointment of independent power producer administrators for the contracted capacity of Unified Leyte power complex. The Unified Leyte geothermal power complex, located in the Eastern Visayas region of the Philippines, is composed of several geothermal units in Tongonan, Leyte. These are the 125 MWe Upper Mahiao, 232.5 MWe Malitbog and 180 MWe Mahanagdong power plants and the 51 MWe optimization plants. Registration is now open for the international geothermal event of the year. The GRC Annual Meeting & GEA Geothermal Energy Expo will bring together geothermal companies, academics, financiers, policy leaders, students, and other individuals to attend or exhibit at the event, to be held from September 29 to October 2 at the MGM Grand in Las Vegas. Early birds who register before August 31 pay only $695 as GRC members or $795 if non-members. The non-member registration includes GRC membership through 2014. Students with a current identification card from an accredited institution pay just $5 which includes GRC membership through 2014. Registration to the GRC Annual Meeting also includes entry to the GEA Energy Expo. Registration is available from the GRC website. A Preliminary Program complete with a Registration Form is available to view and download. However, the GRC recommends online registration through a secured connection. The link is also available on the front page of the GRC website. This is the premier gathering to learn about the latest developments in geothermal energy. Last year, the GRC Annual Meeting & GEA Expo hosted representatives from more than 39 countries. Participants from six continents were present. In 2013, an even broader attendance is anticipated. The GEA Expo floor features a unique opportunity for leaders in the business to showcase their projects, equipment, services and state of the art technology to the geothermal community. Exhibit space still remains but is selling quickly. Join the conversation on Twitter by following the GRC @GRC2001 and #GRC2013 or GEA at @geoenergist and #GEAExpo2013. For GRC Annual Meeting information or sponsorship opportunities, please contact Estela Smith, 530.758.2360 or grc@geothermal.org. For GEA Expo exhibitor or sponsorship opportunities, please contact Kathy Kent, 202. 454.5263 or kathy@geo-energy.org. To request press credentials, please contact Shawna Seldon, The Rosen Group, 917.971.7852 or shawna@rosengrouppr.com. From Geodynamics: The major highlights of the quarter were the successful commissioning of the 1 MWe Habanero Pilot Plant and the successful completion of Stage One of the Earn-in Joint Venture agreement with Kentor Energy for the Savo Island Geothermal Power Project. An important transition is underway with the integration of renewables into the grid. But often overlooked and seldom appreciated is the tremendous potential of geothermal energy. Unfortunately for those in the industry, this fate is justified. Geothermal is not an enticing new source of generating energy competing for attention with the ranks of distributed fuel cells, advanced solar PV or next generation wind turbines -- far from it. There has been an uptick of interest in renewable energy heating and cooling in the past year, with several U.S. states and other countries establishing favorable incentives. After a two-year slump due to the global economic downturn, Navigant Research predicts that the geothermal heat pump market (GHP) will nearly triple to $17.2 billion by 2020, which is a “slow but steady growth” for the industry, according to Navigant analyst Mackinnon Lawrence. Contact Energy Ltd.’s Te Mihi Power Station is the winner of POWER’s 2013 Marmaduke Award for excellence in power plant problem-solving. In early 2007, Contact Energy announced plans to invest up to $1 billion in the construction of new geothermal plants in the Taupo region, located near the center of the North Island. The latest addition to Contact’s renewable portfolio is the two-unit 166 MWe (159 MW net) Te Mihi Power Station. 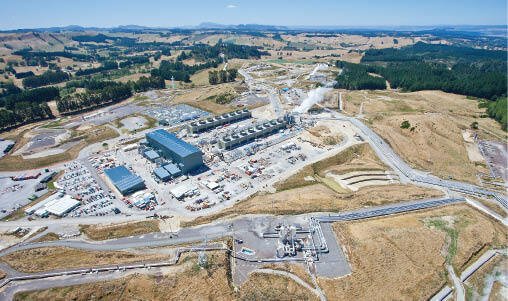 Contact CEO Dennis Barnes says its investment in Te Mihi reflects the company’s view that geothermal is New Zealand’s most cost-effective new baseload generation. Barnes identified the importance of Te Mihi to ratepayers when he said, “The additional 114 megawatts is expected to be required by the market by 2013 as economic growth resumes and will also contribute to lowering Contact’s average cost of generation.” The total cost of Te Mihi is estimated to be close to $623 million. A second project at Tauhara is in the development pipeline, with other projects seeking permits or in the reservoir exploration phase. As this article was being prepared (early July 2013), commissioning work on both units was in full swing and will likely be completed by the time you are reading this article. Performance testing for both units is the next project milestone, followed by a one-month reliability run prior to commercial operation. Using geothermal energy to heat greenhouses is taking off fast in the Netherlands. Rabobank sees further increasing geothermal energy use as a major and relatively cheap step towards achieving the Netherland’s renewable energy goals and a means to improve the financials and the stability of the Dutch greenhouse industry. Geothermal energy could replace an estimated 2 percent (22pj) of national natural gas consumption at an estimated investment cost of EUR 1.6 bn. Hot Rock Limited is an Australian energy company formed to develop geothermal energy in Australia and overseas. Strategically, the company is focused on exploring and developing its extensive portfolio of volcanic prospects in Chile and Peru complimented with Hot Sedimentary Aquifer prospects in Australia.The Board of Hot Rock Limited has commenced a strategic review of the company and its projects. This includes potential options for a restructuring, cost cutting and refocusing program for the company's projects which may include the sale or other disposal of projects currently held. This comes in response to current market conditions in which the ability of the company to raise sufficient capital or to attract joint venture partners to develop the current projects has proved to be extremely difficult despite the quality of the projects held by Hot Rock. The company will advise the market of any material developments in relation to the review as and when they occur. With Kenya's proximity to the Great Rift, once a hotbed of volcanic activity, the country is the biggest producer of geothermal energy on the continent. Currently 13 percent of the national grid is powered by this renewable energy, but untapped geothermal fields have the potential to cover all of Kenya's power needs, and then some. Near the Kenyan town of Naivasha, Isaac Kirimi treks up a steaming hillside. Kirimi is a drilling superintendent with KenGen, Kenya’s leading power company. Centram Geothermal Inc., a private geothermal exploration and development company based in Toronto, Ontario in Canada, announced today that it has entered into an agreement with ADAGE Ventures Inc. regarding the exploration, development, and financing of the company's projects in Central America. ADAGE is a private Canadian company specializing in sourcing, designing, structuring, financing and developing geothermal energy solutions. The ADAGE team has broad and deep expertise in geology, renewable energy development in emerging economies, strategy consulting, finance and law. Under the agreement, ADAGE can earn an interest in Centram by achieving certain milestones in the progression of Centram's projects. The Energy Department's Office of Energy Efficiency and Renewable Energy (EERE) has announced new awards totaling nearly $11 million to help small businesses in nine states develop innovative ideas that could cut carbon pollution, reduce our reliance on imported oil, and boost energy efficiency. Technologies among the 11 projects receiving awards include a project led by Cool Energy, Inc. of Boulder, Colorado, that will test a high efficiency, low temperature geothermal power technology that could help develop geothermal energy resources across most of the United States. Cool Energy has developed an innovative and pioneering Stirling engine, called the SolarHeart® Engine, that converts low temperature heat energy (100°C to 300°C) into electricity. As a result of strong legislative activity in favor of renewable energies, the development of renewable energies in Germany in the past 20 years has made significant progress. Geothermal energy facilities used to produce heat energy have already been established, while the (additional) production of electricity through geothermal energy plants is expected to develop in the near future. According to the Renewable Energy Act, the share of renewable energy in Germany's overall power supply will total 30% by 2020 and is expected to increase continuously. This 30% target is a concrete aim stipulated in the act, but is not legally binding. However, the target is a general principle for execution of the act and a political target of the government. It exceeds the 20% target set out by the European Union to be achieved by 2020. The Geothermal Public Health Assessment findings and recommendations for the area around the Puna Geothermal Venture on the big Island of Hawaii, have been posted in draft form. The 118 page document, is not a scientific research paper, but rather a joint fact finding effort done through a “study group”. It was organized and conducted by Peter Adler at the request of Mayor Billy Kenoi, who at the time was facing increased public outcry over the effects of the existing geothermal industry on public health – specifically in the area nearest the Puna Geothermal Venture plant – and the planned expansion of the industry around the resource. Even as the Centre plans to table a geothermal energy policy in the winter session of Parliament to streamline and expedite projects in the country, Gujarat made a pitch to set up the first geothermal energy plant at an international conference held at Pandit Deendayal Petroleum University (PDPU) here on Friday. Gujarat, Chhattisgarh, Andhra Pradesh and West Bengal are the few states which plan to set up projects with capacities of 3-5 MW. All these projects involve companies like ONGC, Mitsubishi and NTPC. "We are proactive on the geothermal front. A draft policy on geothermal energy is ready," R. N. Sawant, director (geothermal & biomass power) at the Union Ministry of New and Renewable Energy told The Indian Express on the sidelines of the conference on 'Issues and Challenges in Geothermal Energy' organised by PDPU. The geothermal power plant in Apas Kiri is scheduled to come onstream in 2016, said Energy, Green Technology and Water Minister Dr Maximus Ongkili. He said the project on a 12 square kilometre site being undertaken by Tawau Green Energy Sdn Bhd (TGE) was at the site preparation stage would be able to generate 30 MWe of electricity when completed. “This project is a good example of innovation in green energy,” he told reporters after making a visit to the project site yesterday. Renewable-energy supporters and producers celebrated this spring when Colorado legislators approved doubling the amount of renewable energy rural cooperatives must use by the year 2020. Legislators who supported the bill said it would provide expanded opportunities for wind, solar and biomass projects that are popping up in rural areas. One renewable energy source notably absent from Colorado’s list of current projects, however, is geothermal power generation. As it stands, there are no active geothermal power generation projects in the state. It’s a statistic that Pagosa Springs businessman Jerry Smith is determined to change, though the process has taken him five years and likely will take several more. GRC member Jerry Smith sees potential for development of geothermal energy but says that securing financing for geothermal projects is a significant challenge. His company, Pagosa Verde, has two geothermal projects in the works, including one just south of Pagosa Springs. Here's another use for fracking: expanding access to hot rocks deep beneath Earth’s surface for energy production. In April Ormat Technologies hooked up the first such project—known in the lingo as an enhanced geothermal system, or EGS—to the nation's electric grid near Reno, Nevada. "The big prize is EGS," enthuses Douglas Hollett, director of the Geothermal Technologies Office at the U.S. Department of Energy (DoE). "The key is learning how to do it in a reliable way, in a responsible way." By some estimates, the U.S. could tap as much as 2,000 times the nation’s current annual energy use of roughly 100 exajoules (an exajoule equals a quintillion, or 1018 joules) via enhanced geothermal technologies. With respect to electricity, the DoE concludes at least 500 gigawatts of electric capacity could be harvested from such EGS systems. Even better, hot rocks underlie every part of the country and the rest of the world. Australia's first enhanced geothermal system, spicily named Habanero, began producing power in May, and Europe has brought three such power plants online. A US $ 1.2b geothermal power project in western Uganda to mitigate the country's energy shortfall has run into trouble and at the brink of stalling following a sharp dispute over a US$ 60,000,000 arrangement fee. The dispute is between a U.S. infrastructure firm AAE Systems and their local representative, Apex Petroleum Uganda Limited, acting through its director Ahmed Mutimba. Consequently Apex Petroleum in a letter dated July 5, 2013 has petitioned justice and Constitutional affairs minister, seeking to enforce contract performance against AAE Systems Inc.
Italian technology provider Exergy has won a second contract to install four custom built geothermal ORC power trains for Turkish company Çelikler Jeothermal Elektrik Üretim A.Ş. Çelikler, active in the energy, construction and mining sectors, require power trains with a total power capacity of up to 80 MW. Exergy is part of a consortium, including Atlas Copco Energas and SPIG, chosen to deliver the project. Two of the units are for the expansion of an existing power plant project in the Pamukören area, with another two to be installed at a new site close to Sultanhisar, Turkey. Exergy is responsible for the process definition and supply of the entire power cycles, with the exclusion of the turbo generator and air cooled condenser. All power trains will include expander generators supplied by Atlas Copco. Exergy ORC will be at Booth# 412 at the GEA Energy Expo, run in conjunction with the GRC Annual Meeting, September 29 - October 2, at the MGM Grand, Las Vegas, Nevada, USA. Jim Schnieders worked in Jakarta two decades ago, and now he’s back as the new president director for Black & Veatch’s energy business in Indonesia. Looking outside his Jakarta office window this week, the bustling traffic, a much rarer sight when he previously lived in the city, prompted a burst of excitement. “We want to make Jakarta as a part of our growth plan,” Schnieders told the Jakarta Globe in an interview on Thursday. He said the company wanted to double its business in Indonesia within three years. The Missouri-based company offers consulting services for developers of energy, water and telecommunication infrastructure It has nearly 100 years of experience helping companies design, manage, procure equipment for and operate infrastructure projects. Schnieders said that Black & Veatch will continue to participate in coal-fired power plant projects but added that the potential of geothermal energy is yet to be tapped. Several projects are currently underway in the United States to assess the feasibility of combining Concentrated Solar Power (CSP) and geothermal energy together in hybrid power plants. So, what do these projects entail? And what are the prospects for the future development of such plants? Washington-based Rappaport Energy Consulting (REC) has recently secured $149,900 of DOE funding for a project to study the differential data from retrofitting a concentrated solar thermal array to the existing geothermal electrical generation system currently installed at the Oregon Institute of Technology (OIT) in Klamath Falls Oregon. In another development, Oregon-based Utility Energy Forum (UEF) and PacifiCorp have recently released a joint concept paper outlining the feasibility of a hybrid geothermal/CSP solar plant at the PacifiCorp-run Blundell geothermal power plant at Beaver County, Utah. Elsewhere, the National Renewable Energy Laboratory (NREL) is collaborating with Idaho National Laboratory (INL) in a joint project aimed at examining the viability of using heat provided by solar thermal collectors to augment the energy input to a binary power plant. Moody's Investors Service today downgraded Coso Geothermal Power Holding's pass through trust certificates to Caa2 from Caa1. The outlook remains negative. The rating action reflects Moody's expectation of a payment default around 2016 due to continuing energy production challenges at Coso. As of March 2013, energy production was 36% below original forecast and the project generates insufficient cash flow to fully pay debt service. In January 2013, Coso drew $9.7 million from its debt service (DSR) letter of credit. Further draws on the DSR LC are expected over time and we expect Coso will fully deplete the reserve around 2016. We also recognize that the project could default sooner if Coso's $55 million letter of credit facility expiring in early December 2014 is not extended. An inability to extend the letter of credit facility could ultimately lead to a default on Coso's pass through certificates since a default on $15 million of project letters of credit cross defaults to Coso's rated debt. A default on the $40 million DSR LC is not anticipated to cross default to Coso's rated debt. Idemitsu Kosan Co., Inpex Corp. and Mitsui Oil Exploration Co. have begun drilling surveys for geothermal power at two locations in northern Japan. The surveys are being conducted at the Kurikoma national park in Akita prefecture and the Amemasudake area in Hokkaido, the companies said in a statement today. The partners will continue the study through November, according to the statement. The companies plan to drill more exploratory wells at both sites until March 2016 before deciding whether to move on to the next phase of the study. The next stage includes the drilling of production pilot wells, tests for steam production and hot water re-injection, the companies said in the statement. The city of Aspen and its contractor have completed the final stage of drilling a geothermal test well and, they say, initial test results are positive in terms of pressure, geologic layer and temperature. The test well, which is 1,520 feet deep, has water flowing to the surface with initial estimates of temperatures being around the 90-degree range at the bottom of the well and just below 70 degrees at the surface. The city’s consultant, John Kaufman said in addition to the warm temperatures, there were other surprises. An updated energy flow chart released by the Lawrence Livermore National Laboratory (LLNL) that visually depicts the relative size of primary energy resources and end uses in the U.S., with fuels compared on a common energy unit basis, shows the nation consumed more natural gas and renewables but less coal in 2012. In a country heavily dependent on coal and other fossil fuels for energy, accessing new clean geothermal power could both curb climate-changing emissions and provide much-needed new energy. But officials say an effort to transform Indonesia’s energy generation, by providing access to international loans to develop the country’s rich geothermal potential, has potential but is running up against bureaucratic barriers that could slow progress toward reducing greenhouse gas emissions and creating additional power. To support the development of geothermal power, the country is accessing $125 million in loans, at lower than usual interest rates, through the Clean Technology Fund (CTF), part of the Climate Investment Funds, a $7.6 billion international financing mechanism to support low-carbon development and adaptation to climate change in developing countries. When we think of geothermal power, we think of geysers and bubbling, boiling waters that can be tapped for utility-scale production. But there’s a very different world of geothermal power, where onsite implementation can yield water-heating and air heating and cooling, and nowhere is it more clear than at Ball State University in Muncie, Indiana. There, the nation’s biggest ground-source, closed-loop geothermal heating and cooling system now is about to get bigger. University trustees backed completion of the second phase of a geothermal project that when completed – in 2015, according to plans – will save $2 million a year while halving the university’s carbon footprint as it continues to reduce its reliance on old coal-fired boilers. There will be five papers on the topic of Geothermal Heat-Pumps presented at the GRC Annual Meeting & GEA Energy Expo, Sept. 29-Oct. 2 at the MGM Grand, Las Vegas. Geodynamics Limited was honored with the Australian Clean Energy Council (CEC) Innovation Award at last night’s CEC Clean Energy Week Gala Event. The award recognizes the leading edge technology developed and deployed in producing Australia’s first Enhanced Geothermal Systems (EGS) power with the commissioning of the 1MWe Habanero Pilot Plant. The Clean Energy Council is the peak body representing Australia's clean energy sector. The CEC's members are involved in the development of clean energy technologies such as bioenergy, cogeneration, energy efficiency, geothermal, hydro, solar, solar hot water, marine and wind. The ThermaSource Rig 101 perched like a hungry mosquito over the dusty ranchland as workers busied themselves. Somewhere between 5,000 and 7,000 feet below the Walker Ranch Energy drilling site, an underground river of hot water pulsed through the Earth — an everlasting fuel source that developers hope to capture. A stone’s throw away, other explorers already have tapped the 280-degree water, called brine. U.S. Geothermal Inc.’s Raft River Energy project — the state’s only commercial geothermal power plant — has used the brine to power about 10,000 homes a year since 2007. Expectations are high at Walker Ranch, where Rig 101 soon will drill one of Idaho’s few geothermal energy exploration wells in recent memory. Walker Ranch developers such as Trent Yang hope to tap the same resource that U.S. Geothermal has been using. They hope their years of planning will result in a $150 million, 25-megawatt power plant built there by the end of 2015. “It’s testing the waters. Hopefully, they’ll hit some good flow and be able to make something out of it,” said Steve Lubinski, geologist for the U.S. Bureau of Land Management’s Burley field office. Career Opportunities are available at Geothermal Development Company Limited (GDC). To achieve its objectives, GDC is seeking to recruit suitably qualified and highly motivated staff to support the development of steam equivalent to 5000 MW in the next 17 years. The candidates will be responsible for undertaking surface exploration and working on drill rigs in sites including Magadi, Suswa, Bogoria, Arus, Lake Baringo, Chyulu, Mwananyamala, Homa Hills, Menengai, Barrier, Namarunu, Emuruangogolak, Silali, Korosi, Paka, Badlands and Chepchuk. The ideal candidates should be able to work in camping environments in remote areas and have the following attributes: team player, high integrity, excellent communication and interpersonal skills, flexible and willing to work long hours. Deadline for applications is 15th August, 2013. The Scholarship Awards will be presented at the 2013 GRC Annual Meeting and GEA Energy Expo. 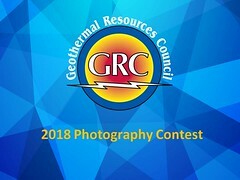 The Geothermal Resources Council (GRC), a non-profit educational association dedicated to the promotion of geothermal energy and associated technologies around the world, is pleased to announce the availability of two (2) $USD 2,500 GRC Scholarship Awards. Selection of recipients will be based upon a variety of factors, including the individual’s academic record, student activities, geothermal industry experience, and career goals. To qualify, one must be enrolled in, or have been accepted into, a graduate-level program in engineering or geosciences, or be a third or fourth year undergraduate majoring in engineering or geosciences. Official copies of all college transcripts. List of student activities, including offices held, as well as a list and brief description of all extracurricular and/or community activities. List of geothermal-related classes and any relevant field or operational experience. Two (2) letters of recommendation from academic and/or professional references. A letter of application discussing the applicant’s background, career goals and objectives, with particular reference to applicant’s relationship to geothermal and the geo-sciences. The letter should also state how the applicant intends to use the scholarship and what results (publications, thesis etc.) will be produced. Applications must be received by August 16, 2013 to be considered. Successful recipients will be notified by September 1, 2013. The Scholarship Awards will be presented at the 2013 GRC Annual Meeting and GEA Geothermal Energy Expo, held at the MGM Grand, in Las Vegas, Nevada, USA, September 29 – October 2. Ross Beaty founded, sold and made a fortune in mining companies. So why don’t investors trust him to do the same in the renewable energy business? Ross Beaty’s career took a sharp left turn in 2008. That was the year the geologist and mineral financier, who made a fortune mining gold, silver and copper, turned his attention to renewable energy. “ I think, quite frankly, that it’s a very difficult business in Canada and it will be a long, long time – requiring very high electricity prices – before it’s an economic proposition.” – Ross Beaty executive chairman Alterra Corp.
“I kind of became an unfortunate expert in geothermal power,” Beaty says, now executive chairman of Canada’s first geothermal electricity company, Alterra Power Corp. He had built and sold several public mineral companies before establishing Alterra in 2008. Beaty’s plan was to build a clean energy business that would be a good investment for shareholders and a good investment for the future of the earth. Geodynamics, said Santos Ltd. and Chevron Corp., developers of shale gas projects in central Australia, are interested in becoming customers. Geodynamics expects to sign a customer in six months to 12 months, Ward said. The company is also planning to apply for funding from Australia’s A$10 billion ($9.3 billion) Clean Energy Finance Corp. and looking for a new partner after Origin Energy Ltd. withdrew from a joint venture this year, he said. The Canadian geothermal industry is significantly lagging behind other countries with comparable resources. To address this issue, CanGEA has embarked upon the preparation of a Technology Roadmap and Implementation Plan (TRM&IP) intended to identify, address and remove roadblocks to the development of a fully fledged Canadian geothermal industry. The TRM&IP represents a sizeable body of work and is not expected to be published until 2015. This summary report, a preliminary study of global best practices, has been prepared to act as an accelerator to the larger TRM&IP. The National Geothermal Association of the Philippines’ (NGAP) held its 10th annual forum to report the resurgence of geothermal energy production in the country. NGAP president and Philippine Geothermal Production Company’s (PGPC) Benjie Aquino along with Energy Secretary Jericho Petilla, push for geothermal as a clean, renewable, sustainable energy source that can help supply power to the country and help mitigate the effects of climate change. Present at the forum held at Dusit Thani Hotel are (from left to right)- Carlos Jose P. Gatmaitan (President and CEO, PNOC Renewable Corp.; Michael Pierce (President, AP Renewables, Inc.); Ariel D. Fronda (NGAP BOD/DOE); Benjie Aquino; Carlos Jericho L. Petilla (Secretary, DOE); Mario Marasigan (NGAP BOD/Dir. REMB, DOE); Sylvia Ramos (NGAP BOD/EDC); Eugene Sunio (NGAP BOD/Chevron Geothermal Services Company); Justin Allen (Deputy Head of Mission, NZ Embassy Mla. ); Antonio Yee (President, PGPC); and Bing Santos (Chevron Malampaya LLC). NGAP is an organization of geothermal energy production companies, service providers, geologists, engineers and research and development professionals involved in harnessing geothermal energy in the Philippines. Cheshire East Council is pushing ahead with plans to harness heat from hot water thousands of meters below Crewe. It wants to use a 2.5-acre site in Leighton West to investigate the potential of tapping into a geothermal energy source which it says could heat every house in the authority's area. To exploit it boreholes 4km deep would be drilled to access water at a temperature of up to 100C. This water would then be pumped to the surface and used directly as a heat supply, or to produce steam to power turbines for electricity production. The Maasai community has vowed to block the expansion of geothermal exploration and taken over the disputed 75, 600 acres of the Kedong ranch. Over 2,000 members of the Maasai community met on their spiritual land in Suswa where they said that the land belongs to their ancestors. Led by their political and religious leaders, they said they are demanding for 5% of revenue generated by KenGen as the geothermal plant was on their land. During the emotional prayer ceremony, the community said that for years it had been oppressed by the previous regimes. Narok East Member of Parliament Ken Aramat said the land belongs to the community and nobody had the right to sell it. KenGen has already embarked on resettling some Maasai’s in Olkaria at the disputed land in Kedong at a cost believed to be worth billions of shillings. The move by the community puts in jeopardy the ongoing resettlement of their fellow community members living in the geothermal rich area of Olkaria. Abstract submission is now open for the 2014 Stanford Geothermal Workshop. Abstract submissions will close on Tuesday 22nd October 2013. ~ Submit an abstract. The 2014 Stanford Geothermal Workshop will be held February 24-26, 2014 at Stanford University, California. ~ Author instructions and a listing of the main themes. Today Geodynamics is hosting a site tour at its 1MWe Habanero Pilot Plant for a group of delegates including The Hon. Gary Gray AO, MP, Federal Minister for Resources and Energy. Additional attendees include representatives from the South Australian Government, and Commonwealth authorities, such as Australian Renewable Energy Agency (ARENA) and Clean Energy Finance Corporation (CEFC), the Department for Manufacturing, Innovation, Trade, Resources and Energy (DMITRE), and the Department of Resources, Energy and Tourism (DRET). The site tour will provide the opportunity for distinguished guests to view the 1MWe Habanero Pilot Plant in operation, witnessing first hand, Australia’s first Enhanced Geothermal Systems (EGS) generated power. 1MWe Habanero Pilot Plant Virtual Tour from Geodynamics Limited. Despite more than a century of scrutiny, the inner workings of Old Faithful and other Yellowstone National Park geysers remain a mystery. Scientists still hash over the basics, such as how water and steam pressurizes underground before a geyser erupts. Now, a high-tech look at Lone Star Geyser, one of the park's most punctual bubblers, could finally solve some of these long-standing puzzles. The research may also help scientists better understand and predict volcanic eruptions. "The signals we record in geysers may put better constraints on the sources that generate those signals in volcanoes," said Shaul Hurwitz, a co-author of the study and a research hydrologist with the U.S. Geological Survey in Menlo Park, Calif.
A graph courtesy of The Climate Institute, and its new publication, Climate of the Nation shows results from a poll of 1,009 Australians (over 18) taken in the first week of June of the popularity of energy sources. Solar and wind are by far the most popular, and wind gained the most support from the previous year, jumping from 59 per cent to 67 per cent. Coal and nuclear were the least popular, with nuclear falling from 20 per cent to 13 per cent. No fossil fuel gained more than 28 per cent approval, and geothermal and ocean energy have yet to capture the imagination. There were also some interesting findings along gender lines. Geothermal energy seems to be a man-thing in Australia, with 28 per cent of men nominating the technology, but only 19 per cent of women. Renewable energy sources, including wind, solar, biomass, hydro and geothermal, accounted for 24.93% of all new U.S. electrical generating capacity installed in the first six months of this year for a total of 2,144 MW, according to the Federal Energy Regulatory Commission's (FERC) latest Energy Infrastructure Update report (PDF). Thus far this year, renewables provided more new generating capacity than did coal (1,579 MWe - 18.36%), oil (26 MWe - 0.30%) and nuclear power (0 MWe - 0.00%) combined. However, natural gas dominated the first half of 2013 with 4,852 MWe of new capacity (56.41%). Among renewable energy sources, solar led the way for the first half of 2013 with 94 new "units" totaling 979 MWe followed by wind with eight new units totaling 959 MWe. Biomass added 36 new units totaling 116 MWe while water had eight new units with an installed capacity of 76 MWe and geothermal steam had one new unit of 14 MWe. Ram Power, Corp. is pleased to announce that the company, through its subsidiary Polaris Energy Nicaragua, S.A. (PENSA), has begun drilling operations at the San Jacinto-Tizate power project. The remediation drilling program calls for the refurbishment of two existing production wells with a targeted increase in steam availability of approximately 9 to 14 MW, or 70-110 tonnes/hour of additional net capacity. The company will utilize the knowledge based on extensive geoscience analysis and the production performance of the wells during the first several months of operations. Drilling operations are being led by Sinclair Knight Merz, the resource consultant for the company, in consultation with PENSA and Thermasource Inc. The program is expected to be completed by late October 2013, and all increased steam resources from the remediation program would be available for plant production during the latter part of the year. The recently released 2013 BP Statistical Review of World Energy, supplemented by REN21′s recently-released 2013 Renewables Global Status Report (GSR), takes a snapshot of the geothermal industry. Geothermal energy is one of the most environmentally benign sources of energy, producing little to no emissions during normal operation. Like hydropower, geothermal electricity is a relatively mature renewable technology, which is reflected by its modest 4% annual growth rate over the past 5 years. In 2012, at least 78 countries used geothermal directly for energy. Over two-thirds of the geothermal energy for direct use was through geothermal heat pumps. 24 countries operated geothermal plants for electricity production. Total geothermal electricity capacity was 11.7 GWe at the end of 2012. Capacity was led by the U.S. with 3.4 GWe of capacity, followed by the Philippines at 1.9 GWe, Indonesia at 1.3 GWe, Mexico at 1.0 GWe, and Italy at 0.9 GWe. On a per capita basis, Iceland leads the world with 0.7 GWe of capacity, which accounted for 30% of the country’s electricity in 2012. Geothermal power will continue to make important contributions to the world’s renewable energy portfolio, but it is unlikely to see the kinds of growth rates likely to be experienced by solar power over the next decade. Geothermal power still produces more electricity globally than solar PV, but was passed up by wind power in recent years. Symbion Power is one of the founding partners of Power Africa, and as one of the initiative’s private sector leaders, it aims to show results. “We were honored that President Barack Obama chose the Symbion Power Plant to announce Power Africa on his recent visit to Tanzania,” said Paul Hinks, Chief Executive Officer of Symbion Power. Rwandans stand to enjoy geothermal energy as an alternative source of electricity after government yesterday launched three wells at the slopes of Mt. Karisimbi in Kabatwa Sector, Nyabihu District. The project, which is in exploratory stage, will focus on drilling three prospective wells, according to the Ministry of Infrastructure. Launching the project, the Minister for Infrastructure, Prof. Silas Lwakabamba, said the country looks forward to generating more energy through devising alternative sources. "Once geothermal is discovered and the extraction done, Rwandans stand a chance to get cheap, accessible and reliable energy," Prof. Lwakabamba said. "This is a milestone because we are entering a new phase and we hope that it will be productive. We believe this will change the cost of energy supply in Rwanda." The Marin Energy Authority (MEA) has signed a Power Purchase Agreement (PPA) with Calpine Energy Services for 10 MWe of geothermal power served from The Geysers in Sonoma and Lake Counties, California. Calpine’s proposal ranked highest among all Open Season proposals received by MEA based upon five primary criteria: location, portfolio fit, project viability, counterparty strength, and contract terms. MEA received 135 project proposals for California renewable energy in response to its annual Open Season Procurement process. The PPA includes a competitive, fixed price throughout the term, and includes a short-term 3 MWe contract for 2014 as well as a long-term 10 MWe contract for 10 years starting in January of 2017. The two contracts will deliver more than 900,000 megawatt-hours and enough to power 13,600 local homes. More than a century ago an Italian prince developed a machine that harnessed the hot air rising from the hills south of Florence to spin a turbine and generate the world’s first geothermal power. Today the region better known for Chianti wine than high-technology produces enough power for a million people. That’s helped make Italy Europe’s biggest generator from underground heat, the world’s cheapest source of electricity. Enel Green Power SpA (EGPW), which operates the plant, says its experience will give the unit of Italy’s largest utility an edge as it spends 900 million euros ($1.2 billion) in four years to take its technology from Turkey to Peru. Researcher Frost & Sullivan Inc. expects the global market to grow fivefold to $5.89 billion in the seven years through 2017 as governments cut green subsidies and seek alternatives to wind and solar. The theme for the 37th GRC Annual Meeting & GEA Geothermal Energy Expo. Sept. 29-Oct. 2 in Las Vegas, is "A Global Resource, from Larderelllo to Las Vegas", celebrating a hundred years of geothermal power. Paolo Romagnoli - Manager Geothermal Center of Excellence ENEL Green Power will be a speaker at the Opening Session. Recent news on earthquakes and a correlation to geothermal activities seem to fill a news hole in the summer and is only distracting on a larger debate on shale gas and fracking by the oil and gas industry. The never ending story of scientific studies proving that geothermal activities cause earthquakes continue and it seems the recent wave of articles is simply another run at the same topic in this case likely to fill a news hole over the summer period. While I am not arguing scientific arguments for geothermal activities being the cause to some seismicity, one has to keep in mind that geothermal power plants and development thereof is in most cases to be found in areas with either ongoing or formerly volcanic activities, which coincidentally can be found in tectonically active areas, such as the San Andreas fault in California, but essentially all along the western coast of the Americas and along the “Pacific Ring of Fire”. The French Foreign Affairs ministry is said to be seeking an operator for a 130 MWe geothermal plant in Dominica which will provide electricity to Guadeloupe and Martinique. French newspaper, France Antilles, has quoted France’s Overseas Minister, Victorin Laurel, as describing the project as a “pain” since it was abandoned by Electricite de France (EdF) which has deemed it unprofitable. “It’s a pain! We seek an operator,” Lurel told reporters on the French Mediterranean island of Corsica last week where discussions on energy transition were being held.